Thomas Brookes Minshall married Eva Cooper at St. Wilfrid’s Church, Davenham, Cheshire on Monday 26 April 1915. The ceremony was conducted by the bride's uncle, the Rev. James Nunn, vicar of Wick, Gloucestershire. The couple honeymooned in Buxton. The wedding was reported upon in The Guardian (Northwich) on Friday, 30 April 1915. Considerable interest was shown in a military wedding, which was solemnized at St. Wilfrid’s Church, Davenham, on Monday morning. The parties were Lance-Corporal Thomas Minshall, of the Northwich detachment of the Earl of Chester’s Yeomanry, and Miss Eva Cooper. Both are exceedingly well known and highly respected in Northwich and the district, and the large attendance of friends at the church was a striking tribute to their popularity. 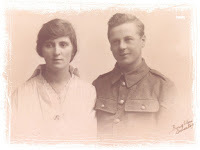 Lance-Corporal Minshall is the son of the late Mr. William Minshall, who was in business for many years as a timber merchant in Northwich, and of Mrs. Minshall, of The Cedars, Leftwich Green. 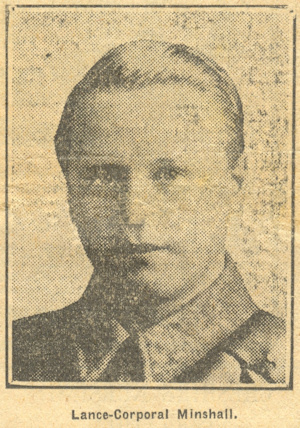 He is a member of the clerical staff or Messrs. Brunner, Mond and Company, in the book-keeping department at Winnington Works, and on the outbreak of war he was amongst the first to respond to the call for recruits, and enlisted in the Yeomanry. Besides his connection with the famous chemical firm, Lance-Corporal Minshall is instructor at the Verdin gymnasium, Northwich and also holds a similar position at the Knutsford Gymnasium. The bride is the daughter at Mr. and Mrs. I. A. Cooper, of Spring Bank, Brockhurst-Hill, Northwich. Her father has for a number of years been superintendent of the Northwich district of the Wesleyan Assurance Society, and Miss Cooper has gained the esteem of the members of the staff by the courteous way in which she has discharged the duties of chief clerk at the district office in the "Guardian" Chambers. Although it was intended that the wedding that the wedding should be a quiet one – the invitations being confined to the immediate relatives - numerous friends as already stated assembled at the church. The bride who was given away by her father looked very pretty in a Wedgwood blue costume with a beautiful hat to match. She carried a sheaf of roses, the gift of the bridegroom. Her ornaments included a gold pendant set with pearls and topaz, presented by the bridegroom, and as a souvenir he gave to the bridesmaid a gold-mounted cameo broach. There was only one bridesmaid, Miss Mabel Aston, of Frodsham, a friend of the bride, and she was attired in mole colour velvet, and carried a bouquet of pink carnations, presented by the bridegroom. The best man was Mr. S.W. Laycock, of Ruabon, a fellow clerk of the bridegroom’s in the office of Brunner, Mond and Company. The ceremony was conducted by the Rev. J. Nunn, vicar of Wick, Gloucestershire, uncle of the bride who also delivered an appropriate address to the newly-married couple. After the wedding the guests proceeded to Spring Bank, where a reception was held by Mr. and Mrs. Cooper. Later in the day the happy pair left for Buxton to spend the honeymoon. Telegrams of congratulations were received from Bandmaster Grayson, of the 1st Seaforth Highlanders: Mr. And Mrs. Moss, Stoke; Miss Winnie Griffin, New Brighton; and the book-keeping office staff of Brunner, Mond and Co.
Lance-Corporal and Mrs. Minshall were the recipients of a large number of presents, including a handsome dinner and tea service from the bridegroom’s colleagues in the book-keeping department of Brunner, Mond and Company, and a complete case of cutlery from the members of the staff of the Wesleyan General Assurance Society in the Northwich district. The latter was formally presented to the bride at a meeting of the staff, held at the “Guardian” Chambers on Friday afternoon. Mr. J.J. Tomlinson, the senior agent, in asking her acceptance of the case of cutlery, referred to the kindly feeling which had always existed between Miss Cooper and every member of the staff. It gave them, he said, great pleasure to show in some small way their good will towards her, and he assured her that the gift was accompanied by the sincerest wishes of the subscribers. The remarks of Mr. Tomlinson were cordially supported by Mr. S. Morris and Mr. W. Faulkner (assistant superintendents), and Mr. F. Shaw (one of the agents). Mr. I.A. Cooper, suitably acknowledged the presents on behalf of his daughter.